FYI, /u/ReasonableFeed, your question (and a bunch of the shittier responses you got) was just featured in an email from the I Will Teach You To Be Rich guy. Just thought you might find it interesting so I pasted it below. I think he's pretty spot on. Don't cut out a vacation--you'll just increase the risk of burnout. You're saving 40k a year, paying your parents 10k a year, and paying down 20k in student loans. You're doing fine (and I promise you that a lot of your peers aren't spending that last 30k which might make up a big chunk of your perceived differences). Heck, you probably have peers who aren't even contributing to their 401k. Meal prepping is an option, but honestly for you it should be more about a lifestyle/health choice than money. You'll probably eat healthier if you do it (you're menu is already set, so you're not going to end up with that cheeseburger and fries for lunch on a stressful day), but it will take up some of your limited free time. You can keep your 401k high...once you max it out, just re-route those contributions into a backdoor Roth IRA. Also, not sure if you factored this in to your monthly income, but your actual paycheck should grow larger by the end of the year as you hit the 401k cap and roll out of social security tax eligibility (above ~128k) and stop paying that extra 6.2&#37; tax. One thing I’ve learned as I’ve made money, grown my business, etc. is how quickly I outgrow advice on the internet. Interestingly, as I moved past the basics, I realized something that nobody really likes to talk about: The best advice in areas like finance, power, and business all happen behind closed doors. Anyone earning six figures sees a post like this and thinks, “The internet is not for people like me to ask for advice,” and quietly backs away from the screen. Yes, this guy makes more than the average person (which he acknowledges). But even high earners have questions. But if you listen to the advice on the internet, this is outrageous and elitist. Wrong. I refuse to give advice that only addresses people in deep debt. That’s why I wrote a detailed step-by-step post on how I spend $50,000/year on luxury services — which a surprising number of people do, but few will write about publicly. If you’re in debt, there’s plenty of advice out there for you. Follow my advice and you’ll know your exact debt payoff date. But what about the rest of us? The people who moved beyond debt, who want more advanced advice about money and psychology and earning power and how to spend it? It’s OK to graduate beyond basic frugality advice. In fact, you should. If you’re still reading the same “tips” you read 10 years ago, something is wrong. It’s OK to want more advanced advice that suits your needs now. And it’s OK to know there are other people out there like you. 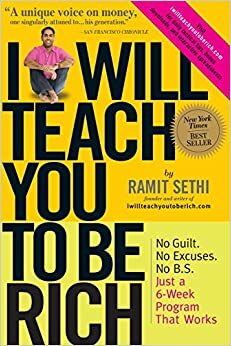 I think a good started book is "I Will Teach You To Be Rich" by Ramit Sethi . It contains all the basics you need and you can expand from there. The One Page Financial Plan  as kokonotu points out is also a good one. I feel anyone who has any sense feels worrisome no matter how much they are socking away. I got a lot more mileage than I thought I would out of books like I Will Teach You To Be Rich by Ramit Sethi(http://www.amazon.com/Will-Teach-You-Be-Rich/dp/0761147489/r...). It rubs some people the wrong way, but it has some really good points about automating finances, and just handling companies via some social engineering. Some of the things I think a bunch of people working day jobs are the insane benefits their companies offer. Make sure both your and your significant other are maximizing their 401k benefit(at least to kick in the employee matching and more if you can afford it). The savings accounts should just keep compounding on each other. Possibly toss some other money into a Roth or into the stock market. Also have a rainy day/emergency fund for when the roof leaks and other unforeseen circumstances. If you have a side project, that money should be coming out of your personal spending money. It should be thought of as your hobby and not impede on the family as a whole(this is for day jobbers). Obviously finances get a bit rougher if there is no day job and it is just startups, it gets more difficult. One of the plans I had envisioned was to have an account setup and once it reached a certain percentage of drainage(aka burn rate for funded companies) that was agreed upon in the family, then there would be a meeting to discuss hanging it up and looking for a new day job to refill the fund to try again. If you luck out and get funded and/or someone buys a project, that money should go first to replenish the project fund and then go into emergency, savings, and a little left over to celebrate(vacation, new back door, etc).